Our tuk-tuk clattered past tinder dry, barren fields, scattering red dust and disturbing roadside trash in the wee pre-dawn hours. At least it wasn’t hot yet. In fact, I was digging around inside my daypack for a jacket when we pulled up alongside hundreds of other tuk-tuks shuttling bleary-eyed tourists to Angkor Wat to witness the infamous sunrise. It was still dark when the gates opened at 5:00 a.m.; flashlights bobbed across the floating bridge as we hurried into the courtyard. We had been here yesterday, making the huge mistake of renting a bike and pedaling the 5 miles to the Angkor Archaeological Park in the suffocating mid-day heat over potholed roads. (Travel tip: hire the tuk-tuk.) We headed directly for a spot near the pond and set up our tripod. Then we waited. Two hours later, our patience was rewarded as the sky transitioned to pink and then firey orange as the sun ascended above the horizon, casting the temple in silhouette. We joined the chorus of ooohs and aaahs, snapping away to capture the moment. Before coming to Siem Reap, I had the misconception that Angkor Wat was a single temple. That is technically true – Angkor Wat is the name of one of the most impressive temple cities in a vast complex of other Hindu and Buddhist temple cities built by various Khmer Dynasty rulers during a 500-year period between 900 and 1400 A.D. We hired a tuk-tuk driver to shuttle us along the “big circuit” to explore the other temples, such as Angkor Thom and the Bayon, Ta Keo (made famous from the movie Tomb Raider), Sra Sarang Baray (a large pool that has retained its water for over 900 years), Pre-Rup and East Mebon. Armed with the recommended Angkor tourist bible, “Ancient Angkor” by Michael Freeman and Claude Jacques, we spent the day noting architectural differences, critiquing lintel styles, identifying gopuras, deciphering bas-reliefs, and becoming familiar with Hindu figures such as Vishnu, Shiva, Garuda, Apsaras, and Naga. The temples share one thing in common and that’s the three base materials that give them their characteristic reddish-brown tint: bricks, hand-hewn sandstone, and laterite, a porous iron-rich clay. In their time, the temples would have been brightly painted, but there are only faint traces of this today. The Khmers thought of their temples as houses for gods. The highest sanctuary was for the most important gods, with shrines to hundreds of other gods proceeding outward from the primary terrace. A temple might house shrines and statues to hundreds of different Hindu gods. Later, as Buddhism spread among the Khmer civilization, kings often remodeled or expanded temples built earlier, modifying them to suit the leader’s preferred religion (Hinduism or Buddhism). The cities lay outside the temple shrines, but enclosed within walls protected by moats. Tens of thousands of people lived within these temple cities. 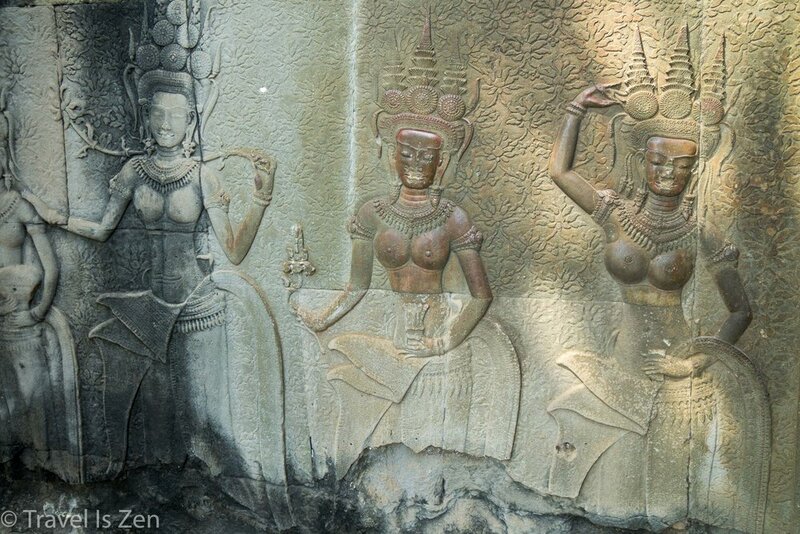 It is estimated that 80,000 to 150,000 people lived in Angkor Thom in its heyday. As the sun sank and the sky once again glowed a red-orange, I was thankful for the experience of seeing these great relics of antiquity. Because of Cambodia’s civil war and unrest for over twenty years, from the 1970’s to the 1990’s, its borders were closed to tourism. It’s only been a little more than a decade since tourism resumed and Siem Reap is still a little raw around the edges as it catches up. Our tuk-tuk driver gave us a detailed account of Cambodia's horrific past and sketchy political state, which I verified with my own research and wrote up in a short e-book. I wish Cambodia well in its endeavor to combat corruption and propaganda on all fronts. What a hot mess!